1.Welded Hinged Spring Bow Centralizers are high quality welded products, which meet or exceed API 10D specification. 2. 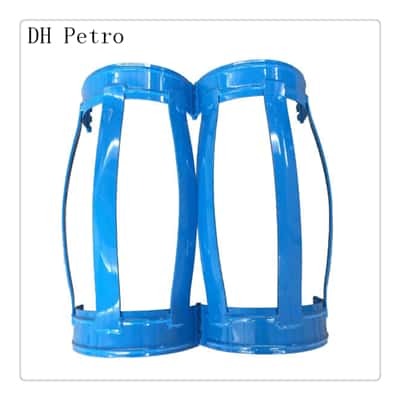 Welded Centralizer has more Restoring Force as compare to Non Welded Centralizer. 3.The Centralizers have Bow Spring strongly welded to the End Collar under required temperature and condition with extra low Hydrogen coated Electrodes. 4.Integral hinge folded on the inside stay intact even under extreme stress. 5.The End Collars are designed with a Reinforcing Rib stamped into the End Collar to give maximum structural toughness. 6.These generally shipped in half assembled condition for economy in shipping and storage cost. 7.These Centralizers are available with combination of Bows configure from choice of seven standard Bow height for optimum Starting and Restoring Force. 9.These are available in all sizes ranging from 4 1/2″ to 20 “.